Featuring the work of Kristy Deetz, Reni Gower, Jane Nodine, and Daniella Woolf. Enticed by touch, these artists explore a wide range of materials and processes linked through craft and meaning. With a shared focus on encaustic (pigmented hot wax) FLASHPOINTS beautifully underscores where material and intent converse and fuse. the works in this exhibition resonate with a profound tactility echoed through substance, image and idea. The viewer is invited to explore an immersive sensory-filled experience that is defined by more than just wax. FLASHPOINTS is curated by artist and retired Virginia Commonwealth University Professor Reni Gower. Nine years in the making, this show was curated from all 50 states. Vinyl cut is the first time I've tried this technique. Installed on the gallery window. I will be attending the College Art Association annual meeting in New York. In an art world that values youth and immediate gratification, how does a mature artist sustain a decades-long career? Getting old is not for sissies and being in it for the long haul takes stamina, grit and discipline. Through 4 sequential conversations, this session features artists (ages 60 – 83) who have remained active and productive for over 40 years. Come meet these artists and hear their amazing stories. Be motivated by their longevity and inspired by their legacies. I will be attending the SECAC conference "Y'all"
October 17 - 21, 2018 in Birmingham, AL. Thursday, October 17 at 10:00 am. Opening Reception: August 30, 5-7 pm. Artist Lecture: November 8, 2018, 2:30 p.m.
Pivot.27, 2017, 38" x 27.5" Acrylic on paper mounted on canvas covered panel will be on view. Juror's Talk (Jordan Amirkhani) - February 19 at 5 pm. I will be attending the College Art Association annual meeting in Los Angeles. Workshops cost $20 for CAA members or $35 for non-members unless otherwise noted. * You do not need to register for the conference to participate in a workshop. Pre-registration is strongly encouraged as space is limited. On-site registration is available, space permitting. 2017 SECAC Award for Outstanding Artistic Achievement was awarded to Reni Gower, Professor in the Painting and Printmaking Department at Virginia Commonwealth University. This award recognizes, encourages, and rewards individuals who have been particularly successful in their creative work as demonstrated through regional, national, or international exhibitions or presentations. The Awards Committee recognized Reni Gower for her decades-long record of artistic achievement, one that includes “a dedicated, sustained, and evolving studio practice, an outstanding national and international exhibition record, and numerous curatorial projects that have produced highly successful traveling exhibitions with accompanying educational programming.” The Committee applauded Gower’s ability to weave these paths into a rich and singular studio career that has always asked viewers to slow down, to look, and most importantly, to enjoy. SECAC is a national non-profit organization devoted to education and research in the visual arts. Founded in 1942, SECAC provides advocacy and support for arts professionals and engenders opportunities for the exchange of scholarship and creative activities through an annual conference and publications. Though founded initially as an organization of artists, scholars, and arts professionals from the southeastern states, SECAC has grown to include individual and institutional members from across the United States and around the world, becoming the second largest national organization of its kind. Dusk Acrylic ink on handcut duralar, paper, and silk 22" x 22" will be on view. In this day and age of digital immediacy, the allure of handmade and tactile qualities of paper continue to draw interest. This exhibition seeks to bring the use of paper to the front and center of the artwork created. Papercuts: White/orange Acrylic on hand cut paper 78" x 56" will be on view. SmPapercuts:White/CobaltCad Acrylic on handcut paper 22" x 22" will be on view. In conjunction with "Pulped Under Pressure: the Art of Handmade Paper"
Workshop / Demonstration free and open to the public. Gallery Hours Tuesday–Friday, 10 a.m.–4 p.m. | Saturday–Sunday, noon–4 p.m. Wriston Art Center 613 E. College Ave., Appleton Free, open to the public and accessible Parking on the corner of College Ave. and Meade St. The Art of Brunch: Sunday, Nov 26: 11 am -3 pm. Sunday, November 5 at 2 pm. Co-curated by Reni Gower and Melissa Potter: Pulped Under Pressure: the Art of Handmade Paper features the work of Jullian Burschera, Julia Goodman, Reni Gower, Trisha Oralie Martin, Melissa Potter, Marilyn Propp, and Maggie Puckett. Exhibition features the work of Kim Bernard, Kristy Deetz, Peter Dykhuis, Lorraine Glessner, Cheryl Goldsleger, Reni Gower, Jeffrey Hirst, Laura Moriarty, and Jane Allen Nodine. I will be in attendence. I will be in attendance. my work is featured in the exhibition Form / Force. I will be traveling to Doha as an invited guest for the conference. With traditional hand papermaking at its core, Pulped Under Pressure underscores important contemporary issues steeped in history and craft. Enticed through touch, works by Jillian Bruschera, Julia Goodman, Reni Gower, Trisha Oralie Martin, Melissa Potter, Marilyn Propp, and Maggie Puckett encourage a contemplative slowing down even as they urge acknowledgement of some of the most pressing issues (environmental crisis to global marginalization) facing civilization today. Each artist starts simply with a foundation of pulp made from natural fibers. Their results incorporate printmaking, letterpress, papercutting, and installation with recycled disposable materials (junk mail, egg cartons, old cotton t-shirts, ripped denim jeans) as well as old bedsheets, beetroot, heirloom plants, and illuminated el wires. Proof Perfect is a solo exhibition of handmade paper / pulp paintings and papercuts. Geometric Aljamia: a Cultural Transliteration is featured in a month long celebration of Islamic Culture at Montana State University. For a complete list of the programs / lectures: click on the image. Can an anecdote to our over-stimulated, stupefying, and simulated culture be discovered through the artist's hand? In response to a hyped-up culture saturated with devices that distance, digitize and disembody, many artists utilize repetitive systems and ritualized process as mindful strategies to reveal or derive meaning. By employing a compulsive approach to materials or methods, the artist can provide a lifeline or guide for "making sense" out of the chaotic and fragmented nature of our popular culture for themselves as well as their audience. This session seeks presentations by artists, who are compelled to create slow work by hand through complex systems, intricate patterning, or minute detail in order to organize chaos. An interview with myself and Kristy Deetz appears in this online journal in conjunction with FABRICation at the Art Museum West Virginia University. Les Femmes Folles is a volunteer organization founded in 2011 with the mission to support and promote women in all forms, styles and levels of art from around the world with the online journal, print annuals, exhibitions and events; originally inspired by artist Wanda Ewing and her curated exhibit by the name Les Femmes Folles (Wild Women). LFF was created and is curated by Sally Deskins. On January 1, 2016, my work will be featured in the Winter 2016 Encaustic Arts Institute Magazine, which is digitally published semi-annually by the Encaustic Arts Institute in Santa Fe, NM. The magazine received the 2016 La Vendéenne Award in the Media category for outstanding contribution to the advancement and practice of encaustic art from the International Encaustic Artists (IEA). The magazine is the first of its kind and currently has a readership in over 29 countries with 4,500-5,000 unique views per issue. My section begins on page 68. I plan to be at the reception. Features work by 22 national artists that is uncomplicated to austere in material, construction and design. Outwardly unpretentious works transcend simplicity through visual elegance. Initially presented at the annual SECAC conference in October, we are now seeking additional letters for a future publication and we invite your participation. Our inspiration for this collection of letters stems from two previous publications. We think Life Lessons: Letters to a Young Artist will be a timely update to these thoughtful and empowering anthologies. From 1902 – 1908, Rainer Maria Rilke corresponded regularly with a young poet. Ten of these letters were published as Letters to a Young Poet in 1929 by Franz Kappus, the military cadet who received them. Rather than critique the young man’s poetry, Rilke offered observations on how to live, love, and experience the world. Inspired by Rilke’s letters, Art on Paper magazine printed a collection of letters in 2005 written by contemporary artists to a fictional young artist seeking advice. These were subsequently followed by the small publication Letters to a Young Artist. Whether written 100 years ago or ten, both publications offered earnest advice or frank admonitions that revealed artistic minds and temperaments at work in the world. Given the alarming erosion of First Amendment rights, marginalization, and a growing disparity between the social, political, economic and cultural networks of our society, it seems more crucial than ever to address the constrained choices facing a new generation. What should and can we say to the young artist today? As teachers, what is our responsibility to future generations, to history, and to the traditions that informed our vision? We are excited to move forward with this project and hope you will participate. Please feel free to share this invitation with other outstanding teachers you know. Contact us with your questions. We look forward to hearing from you. Michigan State University for their Art in Public Places Collection. Pulped Under Pressure features the work of Jillian Bruschera, Julia Goodman, Reni Gower, Trisha Oralie Martin, Melissa Potter, Marilyn Propp, and Maggie Puckett. Co-curated with Melissa Potter. Designed to travel. Click image for link to prospectus. I co-curated (with Virginia Derryberry) an exchange exhibition and catalog between my students in Merit Studio / Painting and Printmaking Department / Virginia Commonwealth University and students in the Art and Art History Department at University of North Carolina Asheville. I was a Visiting Artist Sep 11-18. Gulf Times "Ladies of Substance" Review, Sep 24. Juried by Amy Moorefield, Deputy Director of Exhibitions and Collections at Taubman Museum of Art, Roanoke, VA. I was the juror for Touch of Red - an all media exhibition. Artists include Jaq Belcher, Beatrice Coron, Michelle Forsyth, Reni Gower, Lenka Konopasek, Lauren Scanlon, Daniella Woolf. FABRICation incorporates a textile sensibility through elements of fabric and fabrication. Inspired by a rich array of historical textiles (drapery to quilt) these complex multi-part constructions are encoded by traditional handicraft to contrast our culture's rampant media consumption with the redemptive nuance of slow work wrought by hand. Saturated with vibrant color, the luminous materiality activates the senses and counters passive visual skimming. Works by Erin Castellan, Kristy Deetz, Virginia Derryberry, Reni Gower, Rachel Hayes, Susan Iverson, Natalie Smith range from delicate illusions to layered constructions to architectural interventions. Mixed media includes oil and acrylic paint, vintage clothing, aluminum screens, wool, silk, plastic, thread, vinyl, burlap, rug-hold, glass, recycled objects, and found fabrics. Workshops conducted with Jorge Benitez on papercutting and perspective in association with Geometric Aljamia: a Cultural Transliteration. For the months of November and December I am an artist in residence at the International Cite for the Arts in Paris. My research is focused on the sacred geometry embedded in the stained glass windows of many French cathedrals and churches. Motifs are being developed for new papercuts and a suite of small paintings that will be the basis of larger works in my Fragments series. For two days, I worked with an amazing team of artists in CBPA exploring pulp painting, blow-outs, and watermarks. I was invited in conjunction with a showing of Papercuts. 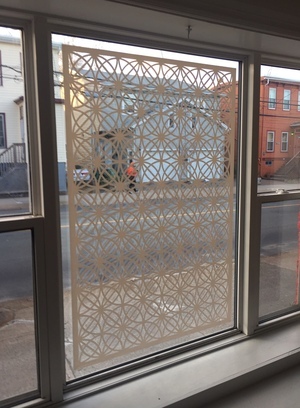 As Papercuts continues to travel, it never gets old to see the work installed in new configurations. Artists include: Jaq Belcher, Beatrice Coron, Michelle Forsyth, Reni Gower, Lenka Konopasek, Lauren Scanlon and Daniella Woolf. I was recently honored by Virginia Commonwealth University and VCUarts with two Awards for Outstanding Teaching. It has been a privilege to work at VCU for over 3o years and I sincerely appreciate the recognition of my peers. 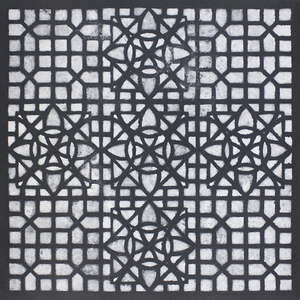 Geometric Aljamia: A Cultural Transliteration is a cross-cultural collaboration that addresses how connections between the Middle East and the West during the Golden Age of Islamic Civilization continue to be relevant and vibrant in the twenty-first century. The project includes artists, designers, performers, and writers from Afghanistan, Qatar, United Arab Emirates, Canada, and the United States. Aljamía is a medieval Spanish word that refers to Romance languages written in Arabic script. The resulting transliteration contributed to the dissemination of the Arabic language and Islamic influences throughout the Iberian Peninsula and beyond. By understanding the arts as a transliteration of one form of thinking to another and addressing the fundamental patterns and geometry embedded in visual art and poetry, this project revisits the ongoing impact of Islamic art, science, and philosophy throughout the world today. Exhibition available for future bookings. Sponsored by American University in Dubai and The Global Center for Drawing in Melbourne. We were invited to present Geometric Aljamia, which included the exhibition, a session talk, and several performances. Our drawings were also part of Location curated by Irene Barberis at Jam Jar Gallery. We conducted pre-conference workshops. 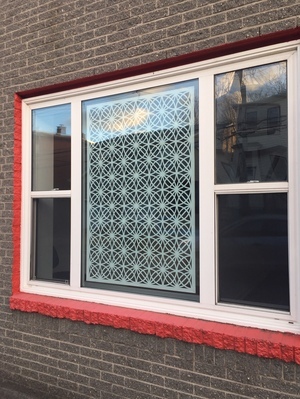 Mine explored sacred geometry through paper cutting. The students' accomplishments were mounted in an exhibition for the conference. Before heading home, we traveled on to Doha for another round of workshops. FABRICation incorporates a textile sensibility through elements of fabric and fabrication. Inspired by a rich array of historical textiles (drapery to quilt), these complex multi-part constructions are encoded by traditional handicraft to contrast our culture’s rampant media consumption with the redemptive nuance of slow work wrought by hand. Saturated with vibrant color, the luminous materiality activates the senses and counters passive visual skimming. Works by Erin Castellan, Kristy Deetz, Virginia Derryberry, Reni Gower, Rachel Hayes, Susan Iverson, Natalie Smith range from delicate illusions to layered constructions to architectural interventions. Mixed media includes oil and acrylic paint, vintage clothing, aluminum screens, wool, silk, plastic, thread, vinyl, burlap, rug-hold, glass, recycled objects, and found fabrics. The exhibition is available for future bookings. Heated Exchange's opening coincided with the 2014 SECAC conference. I co-moderated a SECAC session that included several of the exhibiting artists. I also started my second term as the Virginia Representative on the SECAC Board. My 2014 VCUarts Research Reassignment will allow me to pursue numerous international / national exhibitions, residencies, and workshops over the course of the fall semester. Stay tuned for exciting news from Dubai, Doha, and Paris, as well as Sarasota and Chicago. Mid America Arts Alliance is touring my exhibition Heated Exchange through their EXHIBITS / USA National Traveling Exhibition Program. For booking information, click on image. Once sealed tight in a mummy's tomb, encaustic , or the art of heated beeswax, now enjoys a renaissance of expression. More than just the preservation of an ancient craft, the works in Heated Exchange prove encaustic is the perfect medium to pose questions, convey mystery, and reveal meaning. Artists includ Kim Bernard, Kristy Deetz, Peter Dykhuis, Lorraine Glessner, Cheryl Goldsleger, Reni Gower, Heather Harvey, Jeffrey Hirst, Tim McDowell, Laura Moriarty, and Jane Allen Nodine. Juried by Patrick Palmer (Dean, Glassell School of Art / Museum of Fine Arts Houston) and John DeLaCruz (Art Colony Association of Directors / Bayou City Art Festival) Artists were invited to create 4 unique papercuts for two consecutive exhibitions. Born in Australia, Czech Republic, Canada, and the United States, the seven artists - Jaq Belcher, Beatrice Coron, Michelle Forsyth, Reni Gower, Lenka Konopasek, Lauren Scanlon and Daniella Woolf - bring a broad range of international perspectives to the contemporary art of paper cutting. This exhibition reveals the centuries-old tradition as an art form and as a process that transforms the medium of paper into contemporary meditations on culture, beauty, and the boundaries between nature and artifice. The results can deceive the viewer into believing that they are not seeing works formed out of the "simple" medium of paper. Papercuts was organized by Reni Gower, who is a Professor in Virginia Commonwealth University's Painting and Printmaking Department. Funding provided in part by VCUarts and Virginia Commonwealth University. Large file that takes a few moments to load. Curated by Patty Haberman. Although the act of cutting and folding apper has a long rich history, contemporary artists have only recently explored paper as an expressive medium. From intricately and precisely cut paper "drawings" to mathematically mind-boggling folds to a single sheet of paper, the artists in this exhibition are pushing the boundaries of the sparse material far beyond the limits of its everyday purpose. I am honored and humbled to receive the 2014 CAA Distinguished Teacher of Art Award in recognition of all my years teaching in the Painting and Printmaking Department at VCUarts. The award ceremony is open to the public on Wednesday, February 12 at the CAA annual conference convocatoin, 5:30 - 7:00 pm, Hilton Chicago Grand Ballroom, 2nd Floor. Nine VCUarts faculty are represented in the new installation of artwork at the US Embassy in Vatican City. These loans, coordinated by the Art in Embassies Program, US Department of State were installed in the US Ambassador's official residence in January and will remain on view for two years. Ken Hackett, recently appointed by President Obama as the US Ambassador to the the Holy See, is also the father of VCUarts Interior Design student Michael Hackett. This project grew out of Ambassador Hackett's interest in involving VCUarts and to accord the school international visibility. Observe the artist, Michelle Forsyth as she continues working on her custom installation. Programming underwritten by MMA Education Partner Alcoa Foundation / Howmet. For this project Laurie Beth Clark invited hundreds of artists to create a single bone, a cluster of bones, or an artwork that is inspired by, uses, or plays with the idea of bones. Episode 416 The Artist as Arbiter podcast on Bad at Sports:Contemporary Art Talk is a recording from our panel presentation at 2013 College Art Conference. My talk begins 16.18 minutes into the recording. Great discussion and Q&A at the end. Organized by Laurie Beth Clark, Professor, University of WI-Madison this project invited artist to create an artwork inspired by bones. The contributions are political statements and personal elegies, memorials to individuals or statements about mortality. Some are serious and some are completely playful. While inspired by the repositories of bones that have accrued in countries like Cambodia and Rwanda (where mass violence has taken place) Ossuary is not a project about those traumas. Rather artists counter images of pain with hopeful or poignant rejoinders. Envisioning hope for the world is one of the things that art can do. Features works of art that incorporate a textile sensibility through elements of fabric and fabrication. Works are inspired by a rich array of historical, ethnic, and decorative textiles that are also "fabricated" in multiple parts or created through arduous process. Revealing slow work wrought by hand, the pieces range from delicate illusions to layered constructions to architectural interventions. The exhibition was organized as a pilot project in support of curatorial aspirations by SECAC members in conjunction with the annual confernece. Co-curated by Kristy Deetz and Reni Gower, the exhibition includes Erin Castellan, Virginia Derryberry, Kristy Deetz, Reni Gower, Rachel Hayes, Susan Iverson, and Valerie Molnar. Corresponding panel sessions occur on Friday, November 1 at 1:15 - 3:15 and 3:30 - 5:30. This exhibition evolved out of a workshop conducted by Gower and Benitez during the 2013 Tasmeem Conference, which was organized by Virginia Commonwealth University (VCUQ) School of the Arts in Doha, Qatar. The KAC's RELEVANT Artist-in-Residence program brings together a select group of talented undergraduate and graduate level art students from across the country. During the week long residence, student artist are mentored by a nationally acclaimed professional artist, attend workshops and round table discussions, and create an original work of art for the Kimball's annual RELEVANT Exhibition. This exhibition features a diverse array of artwork by this year's resident and mentor artist as well as past alums. September 12 - 13, 2013. By addressing the fundamental geometry embedded in two-dimensional art, our workshop acknowledged hybrid connections between Europe, the Mediterranean basin, and the Middle East. In the past, aljamia played a significant role in preserving Islam and the Arabic language in the West. by understanding the visual arts as a transliteration of one form of thinking to another, our workshop revisited the ongoing impact of Islamic art, science, and philosophy throughout the world today. Our collaboration included participants from Richmond, Dubai, Kuwait, Doha, and Afghanistan. Our collaboration produced a beautiful exhibition, insightful panel, and transcendent performance. Artspace, Wednesday, February 13, 9:30 - 12:00. A traveling exhibition is an excellent way to get more out of your promotional efforts. Based on her experience as an artist and curator, Reni Gower offers a six-point checklist for taking your show on the road. Curated by Reni Gower, Papercuts brings a broad range of international perspectives to the contemporary art of paper cutting. Using all manner of tools and paper, the artists create works that range from narrative commentaries to complex structural abstractions. Their works are bold contemporary statements that celebrate the subtle nuance of the artist’s hand through a process that traces its origins to 6th century China. Light, shadow, and color play key roles, transforming this ancient technique into dynamic installations filled with delicate illusions. Artists include: Jaq Belcher, Beatrice Coron, Michelle Forsyth, Reni Gower, Lenka Konopasek, Lauren Scanlon and Daniella Woolf. Features the work of Kim Bernard, Kristy Deetz, Peter Dykhuis, Lorraine Glessner, Cheryl Goldsleger, Reni Gower, Heather Harvey, Jeffrey Hirst, Tim McDowell, Laura Moriarty, and Jane Allen Nodine. Exhibition available to travel March 2013. Click on Title for link to prospectus. TWIST is a traveling exhibition featuring the work of three generations of painter-teachers. This exhibition is a smaller version of the exhibition Re-Generation (first hosted by The Painting Center in January 2012). TWIST traces the regeneration of thought in painting and art education by linking the translation of visual ideas between students and teachers to the teaching of Josef Albers. In art education ideas move, change, get lost, and grow from generation to generation, from teacher to student, from painter to canvas, and back again to the training of new artists and hopefully visually literate citizens. For college-level studio art teachers, the significance of Josef Albers on art education throughout the United States is no mystery. Most have either taken an Albers based color theory course, given an assignment that was somehow linked to his pedagogical strategies, or studied with a professor whose art education was significantly impacted by Albers. While this is not the first show that features a generational link to Albers, it is a show that reminds visitors of the wealth of painterly knowledge that continues to grow. The show will travel to other institutions and visitors are invited to enter their own lineage to Albers on an interactive map by visiting the website at http://www.re-generation.us.com. The artists in TWIST are Heather Brammeier, Siri Berg, Reni Gower, Ric Haynes, Victor Kord, Deirdre Murphy, Richard Emery Nickolson, Alice Oh, Carrie Patterson, Richard Raiselis, Edward Shalala, and Reba Stewart. The exhibition is accompanied by an illustrated catalog of the original exhibition Re-Generation with a creative writing by author: Jennifer Cognard-Black, introduction by artist Richard Nickolson, and statements by each participating artist. The original exhibition and production of supporting material was generously supported by The Emily Mason and Wolf Kahn Foundation and The Genevieve McMillan and Reba Stewart Foundation. To Register: Contact The Upstairs Artspace at 859-2828. Exhibition available to travel January 2013. Eleven artists from North Carolina, Virginia, and South Carolina contribute works that explore the idea of texture and depth through the medium of encaustic. Wax and pigment are combined to create lush, layered works that speak to the versatility of this medium. I will be conducting an encaustic workshop in conjunction with the 2012 SECAC conference for Meredith College on October 20. Curated by Brenda Kele, Clip, Cut, Paper Thin highlights the paper cut works of Patricia Brentano, Beatrice Coron, Jupi Das, Rebecca Gilbert, Reni Gower, and Natalia Ivancevich-Hayes. Curated by Ray Kass, the exhibition features the work of John Clingempeel, David Freed , Ann Glover, Charles Goolsby, Reni Gower, Chris Gregson, Sam Krisch, Talia Logan, and Robert Sulkin. The exhibition is available for travel. Papercuts highlights the work of Jaq Belcher, Béatrice Coron, Michelle Forsyth, Reni Gower, Lenka Konopasek, Lauren Scanlon, and Daniella Woolf. Funding for this exhibition is made possible in part by The Norman Shannon and Emmy Lou P. Illges Foundation, CSU Student Activity Fees, CSU Friends of Art, VCUarts, and Virginia Commonwealth University. Large file takes a few moments to load. Curated by Amie Oliver, this traveling exhibition highlights work inspired by an artist residency in Paris at the International Cite des Arts. Lenka Konopasek, Lauren Scanlon, and Daniella Woolf. Funding for this exhibition is made possible in part by Georgia State University, VCUarts, and Virginia Commonwealth University. Curated by Carrie Patterson, "Pivot.9" will be featured. Click on title for link to exhibition website. Curated by Reni Gower, Papercuts highlights the work of Jaq Belcher, Béatrice Coron, Michelle Forsyth, Reni Gower, Lenka Konopasek, Lauren Scanlon, and Daniella Woolf. Using all manner of tools and paper, the artists create works that range from narrative commentaries to complex structural abstractions. Their works are bold contemporary statements that celebrate the subtle nuance of the artist's hand through a process that traces its origins to 6th century China. Light, shadow, and color play key roles, transforming this ancient technique into dynamic installations filled with delicate illusions. Funding for this exhibition is made possible in part by the Alabama State Council on the Arts, the National Endowment for the Arts, the City of Mobile and Mobile County, VCUarts, and Virginia Commonwealth University. Friday, November 11, 4 – 6 pm. I am moderating and presenting on the panel Sustained Research by Experienced Educators at the 2011 SECAC conference at Savannah College of Art and Design. Highlighting careers of 10+ years, this session features the research of five artists while offering their strategies for balancing research priorities with teaching responsibilities. As a forum on sustained research by seasoned professors, this session gives emerging professionals access to active role models and mentors. The key challenge in this exhibition is for the artists to produce innovative work no larger than 3″ by 3″. I will be showing "St.Chapelle #3". As a living, breathing exhibition, each installation is a "constructs" in itself that reflects the evolving nature of the creative process. By featuring new works at each venue the exhibition continually reinvents itself. Constructs looked spectacular in Space 301. The exhibition featured individual groupings by each artist in an open maze of vibrant color. Funding for this exhibition is made possible in part by the Alabama State Council on the Arts, the National Endowment for the Arts, the City of Mobile and Mobile County. The exhibition is also sponsored in part by the Virginia Commission for the Arts and the Painting and Printmaking Department at VCU. Constructs is co-coordinated by Sally Bowring, Chris Gregson, and Reni Gower. The exhibition is available for travel beginning March 2012 / Venue referrals are welcomed. ArtPrize® is a radically open competition. I was invited to participate this year by Ron Pederman at Cathedral Square. Click on title for my artist profile. Guest speakers included Aaron Landsman, Karen Atkinson, Peter Baldes, Melissa Potter, Sarah B. Cunningham, Kendall Buster, Hope Ginsburg, and Corin Hewitt. The College Art Association’s National Professional-Development Workshops for Artists are supported by a generous grant from the Emily Hall Tremaine Foundation. Hot Mix is featured in this ongoing ever changing exhibition of 11 Virginia artists working in abstraction. The exhibition is available for travel beginning November 2011 / Venue referrals are welcomed. Curated by James Warwick Jones, Glimmer is featured in an exhibition that explores a rich diversity of media, content and styles invested in the materiality of painting and drawing. I will be chairing / moderating the session Sustained Research by Experience Educators at the 2011 SECAC conference at the Savannah College of Art and Design. Thermal Traces highlights the sensuous materiality of encaustic (hot wax) painting. Workshop demonstrations are offered in conjunction with the exhibition that features the artists Kristy Deetz, Lorraine Glessner, and Reni Gower. The exhibition is available for travel May 2011 / Venue referrals are welcomed. I co-chaired 2 sessions in ARTspace at the 2011 CAA conference in New York City - [meta]mentors: Great Art Cities and [meta]mentors: Global Networks. February 9 - 12, 2011. In December, I was one of 4 jurors for the 2011 CAA Graduate Student Artist Fellowships. 6 works from Pivot. (points) and Fragments series. I organized and presented in the Paint Plus panel and mixed media workshop. Reception Follows - Open to the public. Using all manner of tools and paper, an international roster of artists (Jaq Belcher, Béatrice Coron, Michelle Forsyth, Reni Gower, Lenka Konopasek, Lauren Scanlon, and Daniella Woolf) create works that range from narrative commentaries to complex structural abstractions. Their works are bold contemporary statements that celebrate the subtle nuance of the artist's hand through a process that traces its origins to 6th century China. Light, shadow, and color play key roles, transforming this ancient technique into dynamic installations filled with delicate illusions. Available for travel May 2012 - December 2012 or after March 2013. Due to hit bookstore shelves and news stands later this month, my work from the Fragments Series is featured in the forthcoming issue of New American Paintings Edition #88. Juried by Barbara O’Brien, Curator, Kemper Museum of Contemporary Art, Kansas City, MO. Reception for the artists, Sunday, July 18, 3 – 5 pm. Papercuts will be featured in "Summer Solstice" at Page Bond Gallery, 1625 West Main Street, Richmond, VA. Reception for the artists, Wednesday, July 7 from 7 – 9 pm. Work remains on view until August 30. I presented Taking Your Show on the Road / Tips for Traveling an Exhibition at the 4th Annual Montserrat Encaustic Conference, June 2010. Vocalise was on exhibit in Best Foot Forward. I will be visiting Georgia State University Ernest G. Welch School of Art and Design as a visiting artist March 28-29, 2010. Presenting the lecture "Strange Loops" and conducting graduate critiques. I am co-chairing 4 sessions in ARTspace at the 2010 CAA conference in Chicago - Meta-Mentors: Balancing Acts (Thursday, Feb. 11: 12:30 - 2:00) Meta-Mentors: Opt Out of Obscurity (Friday, Feb. 12: 12:30 - 2:00) Meta-Mentors: Show Me the Money (Saturday, Feb. 13: 12:00 - 1:30) Meta-Mentors: DIY (Saturday, Feb. 13: 2:00 - 3:30) A Networking Reception follows at 3:30 - 5:30. All events in ARTspace are free and open to the public. I invite you to attend these informative sessions. Three works from my new series Paper Cuts will be shown for the first time at ArtPrize in Grand Rapids, MI, September 16 - October 10, 2009. Top prizes are awarded by public vote. In conjunction with the 2009 SECAC conference. I am also chairing the panel Visual Ciphers and presenting the paper Diagnostic Encryption.